arrow_backPrevious Nextarrow_forward Sapporo Summer Fest and Otaru Tide Festival Tour 2019-GUARANTEED! A very special summer omiyage tour to Sapporo & Otaru. Enjoy two summer festivals, The Sapporo Summer Fest and the Otaru Tide Festival along with visiting three flower parks, Horomitoge Lavender Garden, Yurigahara Park to see the “World of Lily Gardens”, seasonal flowers and roses at Shiroi Koibito Park. Just the beginning as we have included 2 hands-on experiences, fruit picking at a local farm and music box making in Otaru. There’s also 2 sake brewery visits and a full free day for shopping in Sapporo, one of Japan’s most cosmopolitan cities. Complete with its dryer northern summer weather, wide streets and tree lined boulevards, the city has an almost European feel. 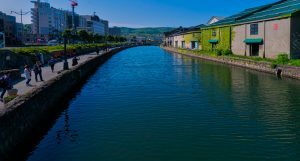 Otaru, one of Hokkaido’s most popular tourist destination for Japanese visitors is a romantic port town steeped in a rich history that dates to its glory days as a major herring center. There are great options for foodies and if you’re into music boxes or any kind of glass objects, this is the place! Come along and join us on this fun filled Hokkaido summer weekend. Guaranteed, you will not be disappointed. Four nights in first class hotel. In flight meals and breakfast daily at your hotel. Final payment due by May 24th , 2019. Package is non-refundable after this date. Starting from $2,195 per person double or triple occupancy. Starting from $2,450 single occupancy. 07/23/19 – Depart Honolulu on Hawaiian Airlines flight 441 at 1:40 pm and arrives in Chitose at 5:00 pm, 7/24. 07/28/19 – Depart Chitose on Hawaiian Airlines flight 442 at 7:45 pm and arrive Honolulu at 8:20 am. (same day).